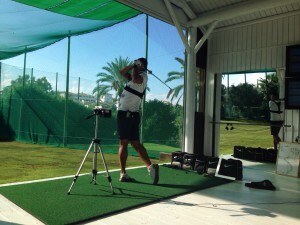 Philippe Allain has chosen El Campanario Golf And Country House to develop his first Boutique Golf Academy. With the same spirit as a Boutique Hotel, you will find the best conditions to improve your game and enjoy a truly exceptional experience. You will work on all the different aspects of your game enjoying the best services like a five star Resort. Thanks to our top of the line technologies we offer our customers a complete body screen to assess their physical limitations and a complete analysis of their golf game. This will allow our team of experts to design a custom made program to achieve the student goals. At the Academy, in order to speed up the learning process, we organise practice sessions on the golf course with real golf balls. The physical side is improved through stretching sessions, massages, and if necessary strength and conditioning sessions specially designed for golf. Our goal is to help you find the balance between your body type, your technic and the way you prepare yourself. Our experience at the highest level of competition will help you find the system that best works for you. The following program will be adapted to any individual’s needs.